Whether you’ve lived here for years or you’re just planning a trip to Las Vegas, you’re in for a plethora of Japanese dining options. 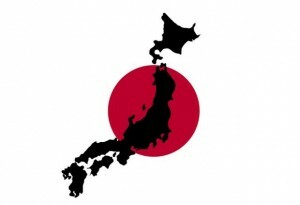 The Japanese scene is nothing new to the entertainment capital of the world. In fact, being neighbors with California resulted in Japanese cuisine making its way to Nevada early on. Here are 3 of many restaurants serving up some of America’s most authentic Japanese dishes. Ramen houses are extremely popular in Japan, especially in Tokyo where there seems to be a small ramen shop on every block. It wasn’t until recently that Americans have developed a craving for this Japanese comfort food. Before American ramen shops opened for business, most of us thought ramen was just a package of noodles bought on a budget. Monta Japanese Noodle House is best known for Kurume style Tonkatsu Ramen, made from pork broth and a specialty soy sauce imported straight from Japan. It is said the Kurume Ramen is the original Tonkatsu Ramen, popularizing ramen culture throughout the whole of Japan. But, that’s not your only option at Monta! The Monta menu features many ramen choices and other Japanese dishes. Other than Tonkatsu, diners may choose from Shoyu (light chicken and vegetable broth with soy sauce), Tonkatsu-Shoyu, Miso (bean paste) Ramen, and even cold dip noodles. Customize your ramen bowl with toppings such as Chashu Pork, Nori, and a seasoned hard-boiled egg. Ramen pairs exceptionally well with a side of Gyoza or bowl of Pork Belly. Recently voted as one of the 50 best Japanese restaurants in the world by the Asahi Shukan. 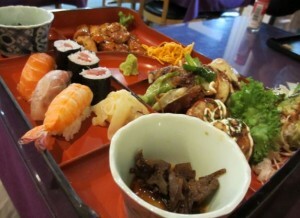 Osaka Japanese Bistro is a hit with locals and tourists alike. Osaka has also won the “Best of Las Vegas” award 20 times! It is the oldest Japanese restaurant in Las Vegas and features a sushi bar, teppanyaki grill, and traditional tatami rooms. Osaka’s sushi chefs are serious when it comes to the quality of their delicate creations, using only the freshest ingredients to ensure a full-flavor experience. 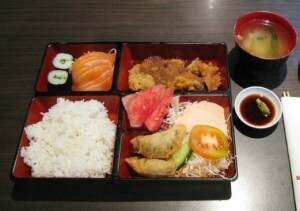 The sushi menu includes a wide variety of classic and modern choices. Standard rolls include the ever-popular California Roll and even a Nevada Roll. For a more adventurous sushi experience, try one of Osaka’s signature rolls such as Shinjuku or Roppongi. Looking for a show? Then you’ll want to try Osaka’s Teppanyaki Grill. Watch a professional chef slice and dice your choice of grilled meats and vegetables. Your chef is likely to have a few culinary tricks up their sleeve.Indulge in the exotic ambiance of Japanese culture with Tatami-Style Dining. Enjoy your meal in a beautiful room featuring tatami mat flooring, shogi screened walls and traditional Japanese décor. Enjoy an appetizer of Garlic Edamame or Yaki Tori with friends, followed by a gourmet dinner such as Shabu Shabu or Kitsune Udon. Be your own chef with a hands-on experience at Gyu-Kaku Japanese BBQ. What better way to enjoy barbecue than fresh off the grill? Enjoy an authentic Japanese Yakiniku (BBQ) dining experience over a smokeless charcoal grill using premium ingredients like Harami Skirt Steak and Certified Angus Kalbi Short Ribs.Choose from three BBQ courses including Meat Lover’s, Surf Turf Jackpot, or the Gyu-Kaku. 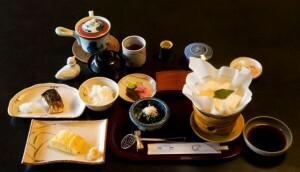 Each course features a variety of side dishes including rice, miso soup, and traditional Japanese vegetables. For non-grill options, feel free to check out their fabulous ramen choices like Spicy Kalbi Ramen.Gyu-Kaku also features an extensive drink menu for those nights when you just want to let loose. If you’re a fan of draft beers and want to try something beyond Asahi or Sapporo, then Gyu-Kaku will certainly catch your interest. They have something that’s sure to pair well with any of your grilled favorites. This restaurant has a full bar, where you can sip on popular cocktails and specialty drinks. Be sure to check out my other blogs on Chinese Cuisine and Korean Cuisine. If you have any suggestions or experiences to share please Contact Me.